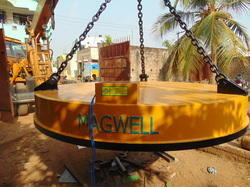 The MAGWELL has high capacity lifting magnets are very sturdy to meet toughest demands in service. The one piece of magnet body is cast from high-grade dynamo steel. Underneath, between centre and outer poles, the magnet body is closed by sturdy, cast and rib-reinforced non-magnetic austenitic manganese steel plate. Fastening at the centre pole is effected by means of a shrunk-on ring, and at the outer pole by locking ring.